With no Dancing with the Stars, I'm all at a loss... So needless to say, I was out in the blogging world tonight & ran across a fun Christmas tag... if you wanna play, let me know so I can stop by! For sure... ELF!!!!! So many favorite parts but every time, when he burps for 5 minutes & then says "DID YOU HEAR THAT?"... I about pee on myself laughing every time!!! Grandma Got Ran Over by a Reindeer.... seriously? This song is popular, WHY? Hey - I'm not a big "hot" drink kinda person... & I'm not a fan of anything milk-y... 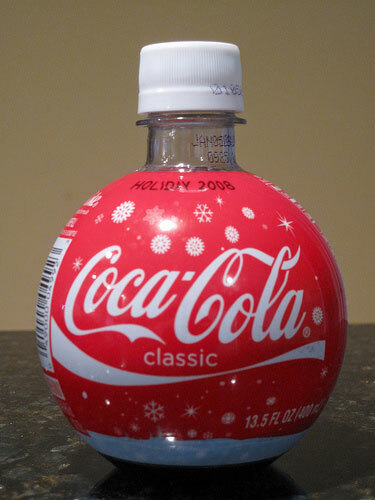 But at least this year, they have coke products in those cute little ornament looking bottles - that's festive enough, right? I just love remembering all the Christmas mornings as a kid... me & my brother waking up, doing what we could to wake our parents up so we could go downstairs to see what Santa left... that anticipation is something that cant be replaced! Our Schnauzer puppy... my brother & I ran right past her & she was sitting under the tree scared to death of two kids running around... she was a great present... a part of our family for MANY years! Just the feeling... Christmas definitely has a "feeling" that can be sensed EVERYWHERE! I PREFER an angel, but we have a Disney Christmas tree... & we actually found a Minnie Mouse Angel - but it kept toppling over at top... they dont make the top of trees very sturdy... so we're ribbon clad at the top. If you saw my post not too long ago, it used to be my grandma's dumplings... but now, I have to say, I look forward to my brother's brocoli casserole... cheesy, yumminess at its best! Doesnt even taste like a vegetable! Probably a Grinch... hate to admit it... but look back to #10... too much pressure at Christmas & too much to do with so little time... I can do some Christmas complaining - that's all I'll say about that! Love them.... at everyone else's houses! I get to enjoy it & dont have to deal with the hassle... so thank you all you Christmas Light Displayers! The ones with the fake beards... FOR SURE CREEPY!!!! But some of them that play along & look the part, those are some fun times! or ones that let me & for teenage girls pile around him - definitely FUN TIMES! That's a given for me... the birth of our Savior, Jesus Christ!!!! Nothing better then that in the world! It goes up every year the day after Thanksgiving, after the Black Friday shopping (can you say EXHAUSTED?)... & it goes down on New Years Day... the house is always so empty looking after that! 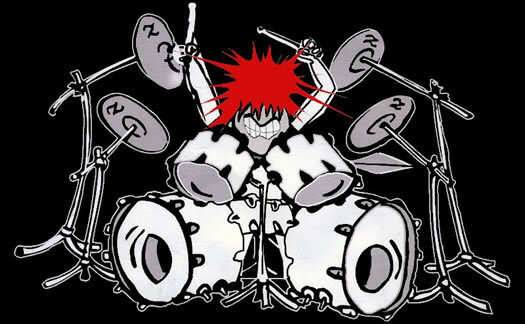 Knowing my husband, it would be the 12 Drummers Drumming... but his drummers would look like the picture here! He IS a rocker afterall! And really, this red headed dude kinda looks like Ricky! Hello?!?! 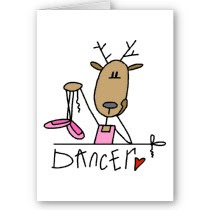 Do you all know me... my favorite reindeer is NOT Rudolph... it would have to be DANCER!!!! ANYTHING baking... if it has sugar & is sweet & is warm out of the oven... mmmm, yeah! Be sure to let me know if you are playing along! I wanna see if you too detest "Grandma got ran over by a Reindeer"
I so love these! My favorite song is "Ding Dong Merrily on High" by Roger Whittaker - very Dickensian Christmas - and I make the best egg nog (whipped cream, ice cream, Ky bourbon, eggs et al - a 1940s recipe that is not like anything you get today)! P.S. thanks for the sooo sweet comment on my post about - it's really special to my heart - and I felt so unconfident about it! There's no better gift than a puppy!! I love the movie Elf. I will do this later for sure.. THanks..
National Lampoon's Christmas Vacation is my fave holiday movie... and it's on TV right now! And "O, Holy Night" is also MY favorite Christmas carol. Just about anyone singing it gives me chills... but especially Josh Groban! I LOVE thie meme! 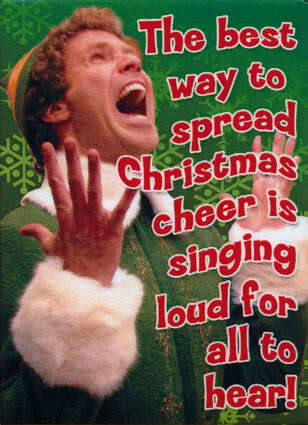 My all time favorite Christmas movie is ELF too! I need to go buy it so we can watch it every year. Home Alone is my favorite Christmas movie. Even after all of these years, it still makes me laugh out loud. I do want to do this...I'll let you know when I post it. 25 questions?! Holy cow! I so had to laugh because I got that coke bottle and saved it, LOL! Also, why does it not surprise me that your favorite Reindeer is Dancer when your favorite show is Dancing with the Stars, haha!!! Now, if only they'd make Dancing with the Reindeers, haha!! Let's make number 25 come true and set up the xbox video chat this year. I think I'll play along. I'll post it tomorrow! 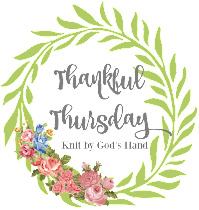 Thanks for stopping by my blog & the well wishes for my mom! "O Holy Night" is my favorite, too! You should check out Collin Raye's version if you haven't already...it's my favorite! AH! I'm totally with on you 1-4!!! About O Holy Night, I love that part of the song too. I get choked up at alot of the Christ centered Christmas songs... Little Drummer Boy is another big fav of mine. Oh I love me some egg nog! I always feel so wistful when they stop selling it in January! What a fun Christmas meme. I hadn't seen this one yet. Mall Santas... I agree, kind of creepy. Although we used to have one at one of our malls that had this great real beard. Totally looked like Santa. I was even a believer! They should all be like that. Nice blog with nice set of questions on Christmas. Will post my questions soon once I am done with buying Christmas gift.